Today marks a very special day for Star Wars fans: It’s May the 4th, aka Star Wars Day. To celebrate, we’re reliving all our favorite Star Wars moments, intensely theorizing about everything that could possibly happen in The Last Jedi, and, of course, stocking up on all our favorite Star Wars merch. In a *very* sad twist of fate, we’ve discovered the most amazing piece of Star Wars merchandise, and, unfortunately, it’s not adults. 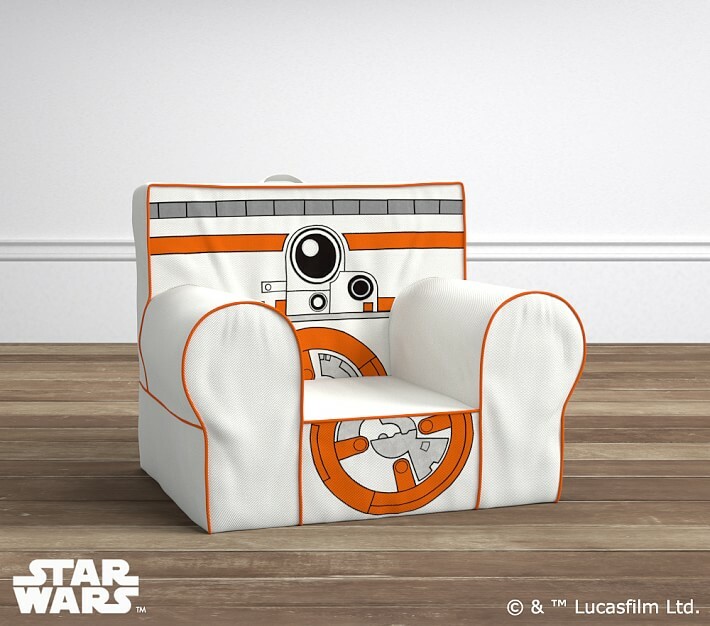 Pottery Barn Kids is currently selling the most amazing BB-8 chair, and although we may not fit in it, we *still* might buy it. While it is far too small for us to squeeze into, it’s perfect for the little padawans (or pups) in our lives. Seriously, though, how adorable is it? Currently on sale for $119 (it’s usually $149), the chair is the perfect seat for your little cousin, kid, niece, or nephew to sit in as you show them Star Wars for the first or 50th time. We can’t imagine getting in the spirit any other way. While there’s currently *not* an adult-sized version, Pottery Barn Kids is full of other Star Wars merchandise, including pillows, that even an adult can enjoy. Luckily, Star Wars is beloved by generations of people, so you won’t have to go far to find the perfect piece of adult Star Wars merch.